We’d love your help. Let us know what’s wrong with this preview of I Like Myself! by Karen Beaumont. 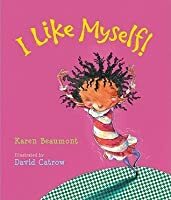 At once silly and serious, Karen Beaumont's joyous rhyming text and David Catrow's wild illustrations unite in a book that is sassy, soulful--and straight fr High on energy and imagination, this ode to self-esteem encourages kids to appreciate everything about themselves--inside and out. Messy hair? Beaver breath? So what! Here's a little girl who knows what really matters. KAREN BEAUMONT's picture books include Being Friends, illustrated by Joy Allen, and Louella Mae, She's Run Away!, illustrated by Rosanne Litzinger. She lives in Capitola, California. To ask other readers questions about I Like Myself!, please sign up. How do you read I Like Myself? A fun and empowering read!! I Like Myself will definitely keep any reader, young or old, entertained and excited about who he or she is. The rhymes are abundant. The illustrations are fun and whimsical. Yet, the message is very clear. BE PROUD OF WHO YOU ARE!! EMBRACE YOUR UNIQUENESS!! I can’t help but like this book. The rhyme is good: catchy and funny (with its accompanying illustrations) and its sentiments are well intentioned. And, it did remind me of a Dr. Seuss book, which is praise from me. And, the pictures are very colorful, large, vibrant, and would be bordering on garish but for their wonderful whimsical content. They’re a lot of fun. This is a children’s book about liking yourself for who you are. I Like Myself! (Wanda Gág Read Aloud Book Award winner, 2005) is a children’s book that displays a little girl who likes herself, just as she is, for things that would be considered unconventional (wild hair and beaver teeth). Children will love this book for it’s catchy rhyming and beautiful, colorful illustrations. She is so full of joy and exudes this throughout the entire book. This book highlights that no matter what someone says about you, your self worth and self esteem are something that I Like Myself! (Wanda Gág Read Aloud Book Award winner, 2005) is a children’s book that displays a little girl who likes herself, just as she is, for things that would be considered unconventional (wild hair and beaver teeth). Children will love this book for it’s catchy rhyming and beautiful, colorful illustrations. She is so full of joy and exudes this throughout the entire book. This book highlights that no matter what someone says about you, your self worth and self esteem are something that come from only yourself - a message I personally appreciate. This would best suit grades K-3. Although there are many ‘self esteem’ books, this one is special in it’s not-so-serious nature, teaching even me that it’s okay to love things about yourself that aren’t necessarily ‘pretty’ either. This book could be used with children of color or in a classroom to display that beauty and talent knows no bounds. In a world where it’s easy to feel like your hair or skin is not the right color or texture, this book grinds against that ideal beauty. I found it interesting that she seems to be the only person of color in the book, all other people appear to be white. This children’s book is perfect for an inclusive class, to recognize that everyone is great and for different reasons (“Some people are fast, some are good at building blocks, some have cool iPads that help them talk!”). Children could interact with this book by brainstorming ways in which they like themselves. Overall, the way this children’s book ignores societal expectations and encourages children to revel in their uniqueness is refreshing and is what makes this a WOW book for me. Artwork is reminiscent of Dr. Seuss. Perhaps this one struck such a sour note with me because I read it at the same time as another picture-book (Eric A. Kimmel's Rosh Hashanah story, Gershon's Monster ) that emphasized how disastrous the consequences can be, for ourselves and for others, when we refuse to really acknowledge our transgressions, but I finished this story with the feeling (one I've had increasingly, of late) that it was promoting, however unintentionally, feelings at the expense of ethics. Don't mistake me: I want children to like themselves, generally speaking. But I'm not on board with the message that they should always like themselves, in every circumstance, and regardless of the feelings and opinions of others. That sensation of self loathing, when we do wrong, is called conscience, and it would be a pretty horrific world without it. Este libro es parte de la antología Girl Power 5 Minute Stories. Esta historia nos enseña un mensaje muy importante, querernos sin importada nuestros defectos. Y lo hace de manera sencilla, concisa y muy divertida. Las ilustraciones no me gustaron, el estilo simplemente no me convenció. I would use this book as a social studies book. I would use it as a method for getting the children to look at the positive attributes they each have and we could use it as an all about me kick-off book. The sweetest, nicest book ever. I love the message (of course), the adorable illustrations, rhyme scheme, and the zaniness. I bought it immediately. I wish gaining self-esteem was easy as chanting "I like myself" over and over, but this book does a fun, colorful job of pointing out that self-acceptance shouldn't be dependent on others' views. The rhymes and pictures are set in a big size book for a board book which is especially nice. Good gift for just about any age. I definitely need to remind myself that I like me even if I have what is comparable to knobby knees or hippo hips or purple polka-dotted lips, or beaver breath or stinky toes o I wish gaining self-esteem was easy as chanting "I like myself" over and over, but this book does a fun, colorful job of pointing out that self-acceptance shouldn't be dependent on others' views. Messages related to identity, self-esteem, confidence, bring proud of what makes you who you are. Such an important message and written and illustrated in a way I truly believe my four year old understood. Prompted a great conversation about all of the things we love about ourselves and each other. This is a story about a little girl who likes herself no matter what she looks like and no matter what others think of her. It is a poem book that kids will easily love right away. The pictures that go with it are wonderful and make the story come alive. I use this book at the beginning of the year when I talk about differences in others, why it's important to honor them, and to not judge people by the way they look. Students can make portraits of themselves and use as a discussion piece as well, perhaps even post them in the room to celebrate all year! 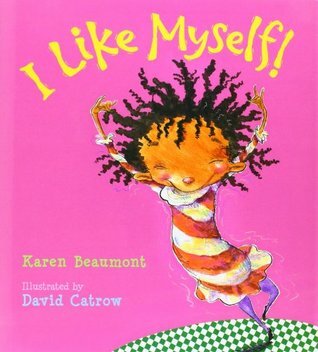 PreS-Gr 2-This curly haired African-American moppet really likes herself. No matter what she does, wherever she goes, or what others think of her, she likes herself because, as she says, "I'm ME!" Catrow's watercolor, ink, and pencil illustrations bring even more humor to the funny verse. The brightly colored art and rhymes are reminiscent of Dr. Seuss's work with their quirky absurdity, especially the full spread of the child and her highly unusual bicycle. Even with "-stinky toes/or horns protruding from my nose," her dog loves her unconditionally. She is so full of joy that readers will love her, too-even when she has purple polka-dotted lips. Titles such as Jamie Lee Curtis's I'm Gonna Like Me (2002) and Kathi Appelt's Incredible Me! (2003, both HarperCollins) have a similar theme, but the main characters are Caucasian. A great addition.-Elaine Lesh Morgan, Multnomah County Library, Portland, OR Copyright 2004 Reed Business Information. The book I Like Myself is a fiction story. It is about a young girl who loves everything about herself. The young girl accepts herself flaws and all. She makes reference to liking her eyes, ears, nose, fingers, and toes, not liking herself any less when she looks a mess, and not being bothered when people stare because she knows there is more to herself than her appearance. As a literacy teacher, I would use this text in the classroom to show students how some authors use rhyme to help the flow o The book I Like Myself is a fiction story. It is about a young girl who loves everything about herself. The young girl accepts herself flaws and all. She makes reference to liking her eyes, ears, nose, fingers, and toes, not liking herself any less when she looks a mess, and not being bothered when people stare because she knows there is more to herself than her appearance. As a literacy teacher, I would use this text in the classroom to show students how some authors use rhyme to help the flow of telling a story. The students could interact with the text by looking at the illustrations and thinking about something they may ot like about themselves, but realizing that we all have flaws and it is important to embrace them. They could then draw a self-portrait and write about why they like themselves, using rhyme. Not much information was available about the author, Karen Beaumont, or the illustrator, David Catron; however it would have been helpful to know if their background contributed to the content in the book. This text can teach children to love themselves and that it is okay to be different, you should just be comfortable with yourself. I would recommend this book to teachers because it shows children people are not locked into a certain role in life due to race or gender, and to also be accepting of others around us. 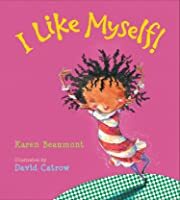 I Like Myself is about a little girl that expresses her self-esteem in imaginative ways, thus, teaching children how to improve their self-esteem no matter what life throws at them. It is also a fun rhyming story with colorful imagery. The target audience for this book is somewhere between ages 4-8. At this age is where children are already developing a slight bit of self-conscienceness, especially between ages 6-8. 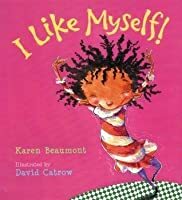 Representation is very important in a children's picture book, and self-esteem in I Like Myself is about a little girl that expresses her self-esteem in imaginative ways, thus, teaching children how to improve their self-esteem no matter what life throws at them. It is also a fun rhyming story with colorful imagery. The target audience for this book is somewhere between ages 4-8. At this age is where children are already developing a slight bit of self-conscienceness, especially between ages 6-8. Representation is very important in a children's picture book, and self-esteem inrichment is a great idea to tackle. Children would like this book for it's colorful and fun imagery and rhyming dialogue. It also uses silly words such as beaver breath and horns to enhance the message in the story. I like myself! / Karen Beaumont. / 2004. In rhyming text, a little girl expresses confidence and joy in her uniqueness, no matter her outward appearance" (NoveList). 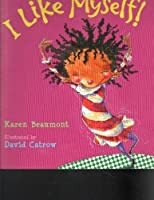 “The brightly colored art and rhymes are reminiscent of Dr. Seuss's work with their quirky absurdity, especially the full spread of the child and her highly unusual bicycle … She is so full of joy that readers will love her, too–even when she has purple polka-dotted lips” (Elaine Lesh Morgan in School Library Journal). This book has a great message, one of accepting yourself and loving you for who you are. I especially liked the illustrations, they were my favorite part. There were a couple pictures where I just thought the particular expression on the little girl was absolutely precious. If you want a picture book that will boost you child's self esteem and have zany pictures to boot, you'd better check this book out. I want to buy this book! Yes, it's a children's book, but the whole family will enjoy. The story is written in rhyming prose and is illustrated by the David Catrow of the popular "David" books. We typed up the poem and stuck it on our fridge in an attempt to memorize this as a family. I want my kids to learn that no matter what anyone else says or thinks, if they like themselves, they will be just fine! This is a cute one. I think I would use this book for kindergarten or 1st grade that just start to learn writing. I would have them write what they like about themselves with a sentence starter like "I like myself because ________." It is important for children to develop their positive self-image early. Trivia About I Like Myself!